Photograph of the Great Sasbahu Temple at Gwalior, in Madhya Pradesh, taken by an unknown photographer in c.1880, from the Archaeological Survey of India Collections. The great fortress of Gwalior is perched on long narrow hill that rises more than 100 m (330ft) above the plain. Many palaces and temples were built on the flat plateau on the top of the hill. The Kacchapaghatas erected the two Sasbahu temples in 1093. This is a view of the larger temple which consists of a sanctuary adjoining a triple-storey mandapa or hall with three projecting porches. A pyramidal roof covers mandapa but the tower over the sanctuary has collapsed. The walls, the doorways and the ceilings preserve some of the foliate decoration but the figural panels on the walls have not survived. 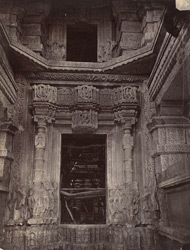 This is a view of the entrance and part of the interior during restoration work, showing some of the carvings around the entrance and scaffolding in position in the interior of the temple.